Eye Patches - Plastic 2.18" x 3.18"
Ideal for treating amblyopia (lazy eye) and strabismus (crossed eyes). 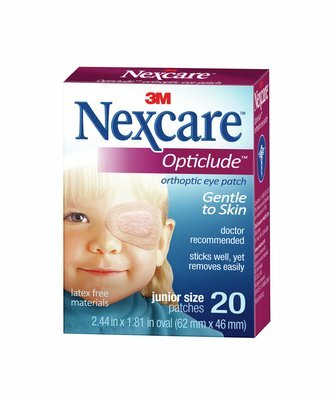 Nexcare Opticlude Orthoptic Eye Patches feature a gentle, hypoallergenic adhesive and highly breathable backing. 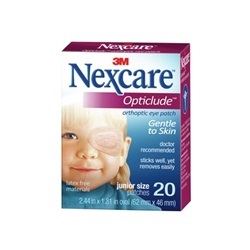 These doctor-recommended orthoptic eye patches stick well and are easily removed. Plastic, regular size, oval eye patch that measures 3.18" x 2.18". Latex free. NDC Number: 08333153901. Comes in a box of 20.